A genus of about 15 species. Besides the following several others occur in the United States. Type species: Andropogon Torreyanus Steud. Andropogon saccharoides Sw. Prodr. 26. 1788. Andropogon glaucus Torr. Ann. Lye. N. Y. 1: 153. 1824. Not Muhl. 1817. 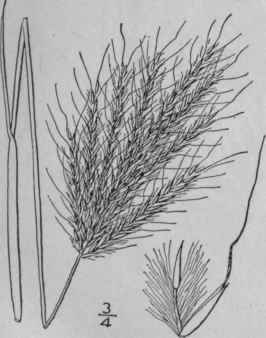 Andropogon Torreyanus Steud. Nomencl. Ed. 2, 93. 1841. Andropogon saccharoides var. Torreyanus Hack, in DC. Monog. Phan. 6: 495. 1889. Culms erect, 1 1/2°-3 1/2° tall, simple or branched, glabrous, the nodes naked or barbed; sheaths glabrous, rarely pubescent, more or less glaucous; blades 3'-10' long, 2"-4" wide, long-acuminate, smooth and glabrous towards the base, scabrous on margins and at the apex, glaucous; racemes 1'-1 1/2' long, in a terminal long-exserted panicle 2'-4' long; joints of the rachis with a thin translucent median line; outermost scale of sessile spikelet 1 1/2"-2" long, about equalling the terminal hairs of the radiis-joints, lanceolate, acute, pubescent at base with long silky hairs; awn 4"-8" long, spiral, bent, scabrous; pedicellate spikelet reduced to a single narrow scale. In dry soil, Missouri to Kansas and Colorado, northern South America, and in Jamaica. Feather Sedge-grass. Aug.-Sept.